When Kevin O’Brien was born in 1954, his mother knew something was wrong right away because no one let her see her baby. Then, two grave but kindly priests entered Anne O’Brien’s hospital room. One was Vincent Cooke — the head of Catholic Charities. Cooke began to break the news that her fifth child might be better off in an institution. “He said they would take care of Kevin,” said her daughter, Melanie O’Brien. “My mother just looked at them and said, ‘No one’s taking my baby,’ ” her daughter said. Anne turned to the priests and asked “Is he Mongoloid?” using the era’s term for people with Down syndrome. “They were just shocked someone would even utter the word. She was very direct,” her daughter said. These were the days before Special Olympics; before people with developmental disabilities appeared on shows like “Glee”; and before many were even seen in public. They raised him like their five other children. He had chores. He went to school and church. He played outside with his brothers and sisters and the scores of kids on their block in the height of the baby boom, when houses tended to be filled with passels of children. If people stared, his mother said to ignore them. If kids at the park said something mean, the bullies might have to face his five siblings — and their friends — and their friends’ friends. In 1968, Mr. O’Brien became one of the first Special Olympics athletes at the inaugural games at Chicago’s Soldier Field. 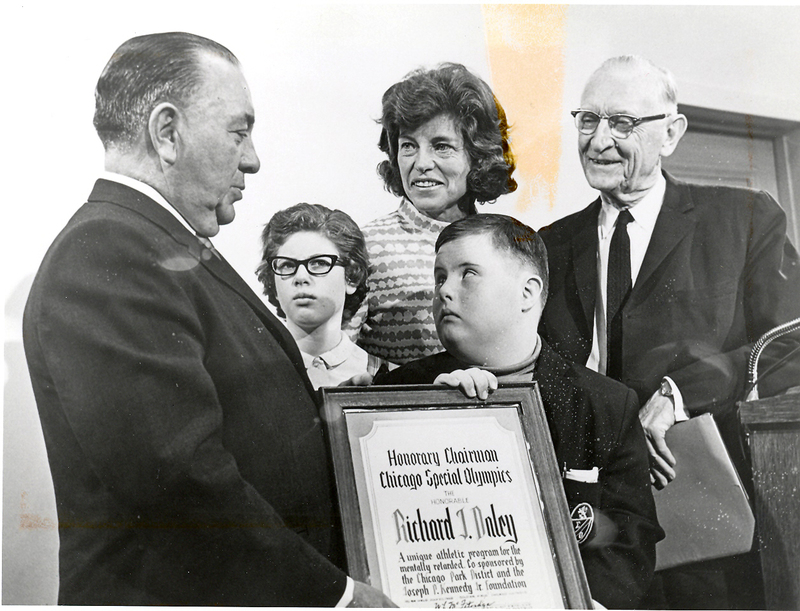 The picture at the top of this page shows him with Chicago Mayor Richard J. Daley, left, and Eunice Kennedy Shriver, center. He competed every year until 2014, traveled the world, and won about 750 medals, many of them gold. He met two Mayor Daleys, Mayor Harold Washington, the president of Ireland, Muhammad Ali, Ernie Banks, Harry Caray, Michael Jordan, Stan Mikita and Mike Ditka. At the 25th anniversary games in Florida, he was invited to light an Olympic torch. 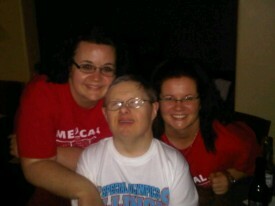 When he was born, people with Down syndrome usually only lived into their teens. Mr. O’Brien died at age 60 on Jan. 20 at the Beverly home he shared with relatives. He had suffered a recent series of strokes. During his life, he was on Chicago’s St. Patrick’s Day parade committee, and he volunteered at a nursing home, where the elderly men appreciated the smooth cheeks they received from his close shaves. At weddings, he twisted, polkaed and spun brides around the dance floor. He liked the buzz at wakes, too. “He just enjoys people, whether they’re standin’ up or lyin’ down,” his sister once told Chicago writer Mike Houlihan. For 35 years, he worked through the Sertomo Centre in Alsip. Usually, he did assembly work on Wilton cake-decorating tips. In 1988, Mr. O’Brien became one of the first people with a developmental disability selected to dispense communion in the Chicago Archdiocese, said Carmella Ammond, a Eucharistic minister for nearly 40 years at St. Catherine of Alexandria parish in Oak Lawn. Like his mother, Mr. O’Brien was direct. When he visited the sidelines at a Bears pre-season game, he met Dave Wannstedt. His sister told Houlihan what happened next. The O’Briens raised their family in St. Catherine of Genoa Parish in Roseland and Oak Lawn’s St. Catherine of Alexandria church. He took classes through what was then known as the Chicago Association for Retarded Citizens, Gompers elementary school in Chicago and Eisenhower High School in Blue Island. In 1968, “When Anne Burke started the Special Olympics, my parents were the first ones there,” Melanie O’Brien said. He excelled at swimming, bowling, bocce ball, race-walking, floor hockey and golf. 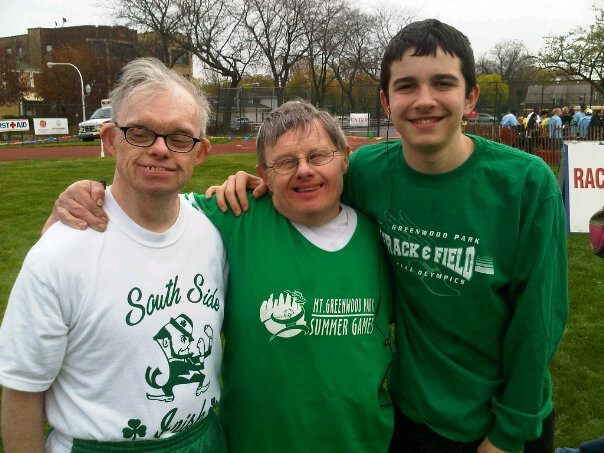 Burke, an Illinois Supreme Court justice, said credit for the Special Olympics should be shared, not only with Chicago Park District leaders and the Kennedy family, but with the participants. 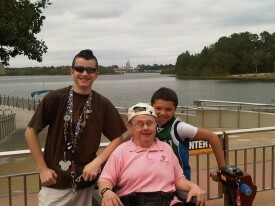 She was 21 and teaching physical education in the parks when she met 11-year-old Kevin O’Brien. “We grew up together,” she said. Burke had just begun advertising athletic activities for children with special needs. Mr. O’Brien loved fried chicken. He enjoyed the voice of Frank Sinatra, whom he referred to as “Frank Rhinoceros” because he had trouble saying his name. He also enjoyed the singing of Chicago’s Catherine O’Connell and Ireland’s Mary McGonigle. Mr. O’Brien also is survived by two more brothers, James and Martin. A sister, Bonnie Sullivan, died before him. After the Jan. 24 funeral, his family handed out some of his many medals to remember him by.